The free automated schedule ftp backup program was created for a simple and universal need “secure and easy offsite backup”. This program was designed to enable quick and easy online backup of multiple files with version control. The program automatically zips and uploads your backup files at a daily scheduled interval to an offsite backup FTP server of your choice, FTP space is cheap and many hosting companies charge less than $5 a month for up to 10 GBs of space. This tool revolutionizes the way you look at offsite backups. No expensive services to sign up with, no complicated configuration. The program comes with no attachment to any hosting company; you can buy space yourself or simply use an alternate offsite server as your backup device. Automated ftp can save you both time and stress in building an offsite backup strategy. Scheduled ftp does not need any human intervention, the program wakes up at a configurable time each day to upload new files and delete old files off the ftp server automatically. A perfect offsite backup tool! Like other Pulse products this software has been written with managed high quality code to deliver powerful features with stability and scalability. It has been tested and certified to be able to upload 500 GBs of data at a time to a FTP server that supports large transfers. The Automated ftp program has been deployed on 100s of client boxes and has been proven time and time again to be an indispensable asset in backup strategy planning. 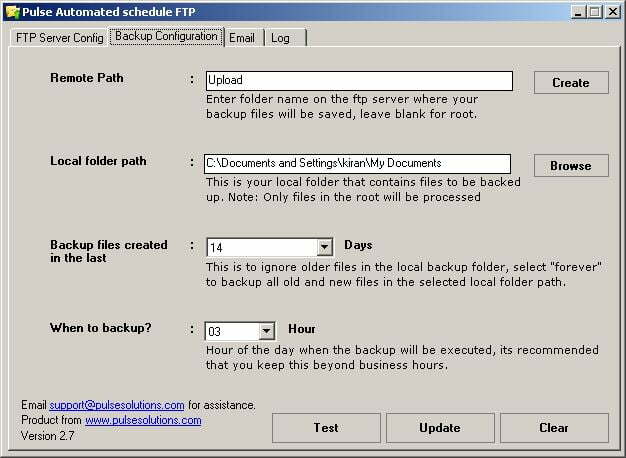 The Automated schedule ftp backup program is designed to upload large backup files from a single folder, we recommend you use the windows scheduler, SQL Enterprise manager or any other backup software to create the backup files for the software to upload automatically. 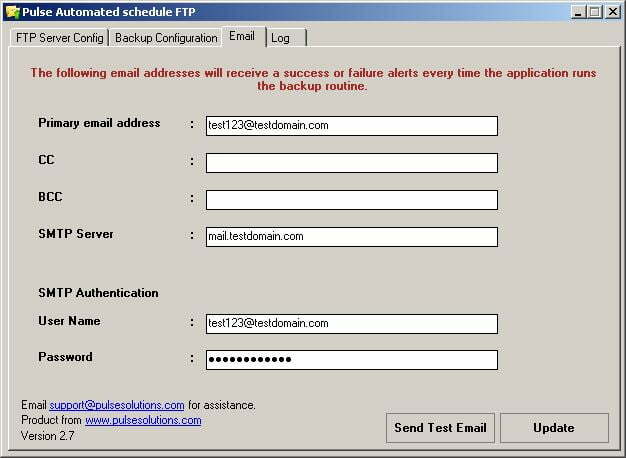 Every successful or unsuccessful upload routine generates an email alert with complete information on files successfully uploaded, files purged from the server at expiration and files that could not be uploaded. You never need to manually check if your backups are working! Pulse engineers use this program in their failsafe backup strategy with the primary backup destination being a local tape drive or SAN. Often online backup is far easier to access and restore compared to a traditional tape backup. This scheduled automated ftp backup program offers a seamless offsite backup with practically no investment at all. It’s a tool that can make you sleep easier in the night knowing that your backup process has a failsafe which ensures even if the facility burns down your data remains safe. Setting up in a matter of seconds the program uploads files automatically and sends you an email about the success or failure of the process using SMTP. Configurable FTP server, any standard FTP server can be used. Automated creation of backup folder on the destination server. Configurable number of days to keep the backup files on the server. Very low footprint, no affect on server performance at all. This program is simple in operation with managed code and automatic troubleshooting programmed for common FTP server errors, it’s been proven on 100s of servers with different software configurations and comes with a 100% compatibility guarantee with any commercial FTP server software. Please Contact us today if you are looking for a custom ftp program or professional deployment of a backup strategy. IP or domain name of the FTP Server. 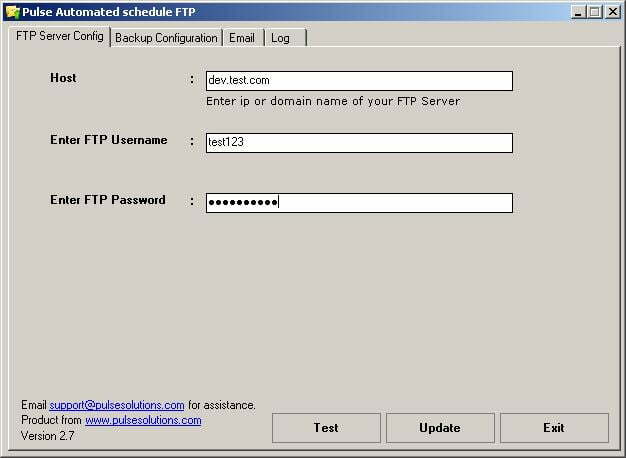 Clicking test will run a test routine that checks if the authentication can be used to create a ftp session with the entered server. After a successful test you can click update to save settings. Close the software and exit. Folder on the ftp server where your backup files will be saved, it is recommended that you create the application an exclusive folder to work with. If the folder does not exist you can click create to create the folder on the server. Browse to the local folder that contains files to be backed up. It is recommended that you use windows backup, enterprise manager, my sql backup or something similar to put backup files in this folder to be uploaded. This is the number of days that you want to retain the backup on the online server, generally keeping 2 months of backup on the server is ideal. Any files older than the number of days you select would not be backed up and once uploaded files reach this limit they would be removed off the ftp server to save you online space. Select the time when the application will upload files, ideally this should be beyond business hours to ensure the application does not slow down internet access. Clicking test will run a routine test and report problems if any with your configuration. After your settings have been verified by a test click update to save and start the service. Clears all settings and start over. Email address that would receive the daily alert about files being uploaded successfully or an alert about a failure that stopped the upload. Carbon copy of the alert emails would be sent to the email address entered here. Blind carbon copy of the alert emails would be sent to the email address entered here. Your email password, this would be securely saved and its only used to send you emails. This button runs a routine to test if we are able to send you an email. After your test succeeds click update to save your settings and start the service. File name that was processed. All files are zipped before upload which saves space and upload time. Date when the file was zipped for upload. Date when the file was uploaded to the ftp server. Uploaded: The file has been uploaded on remote server. Retry: The file could not be uploaded in the first try, its in the retry bin and it will be retried in at the next available opportunity. Deleted: The file has been deleted from remote server after the expiration of the days configured. Sample email alert that goes out after the files have been uploaded, the status would show Success or Failure.